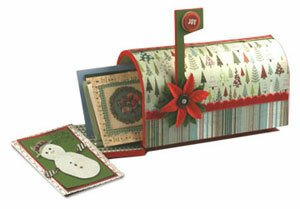 Simple scrapbooking techniques, colorful papers, embellishments and Glue Dots are what you need to create this festive holiday mailbox from Glue Dots. Remove the flag from the mailbox and paint the mailbox and flag. Cut two 10" x 5" strips of patterned tree paper. Be mindful of the pattern direction. If there's no direction to the pattern, use one 10" x 10" strip. Apply Continuous Glue Lines to the outer edge of the reverse side of the patterned paper and adhere to the top of the mailbox. Cut two 10" x 2" strips of the striped patterned paper. Apply Continuous Glue Lines to the outer edge of the reverse side of the paper and adhere to the bottom sides of the mailbox, making sure the bottom edge of the paper lines up with the bottom edge of the mailbox. Trace the back of the mailbox onto the striped patterned paper, cut out and apply to the back of the mailbox using Continuous Glue Lines. Trace the front of the mailbox onto herringbone paper, cut out and apply to the inside front of the mailbox with Continuous Glue Lines. Trace the flag onto desired cardstock and adhere to the front side of the flag. Cut 10" strips of ribbon and adhere over top and side seams of patterned paper using Continuous Glue Lines. Screw flag onto the mailbox. Use Craft Glue Dots to adhere the poinsettia to the leaves and secure to the mailbox. Use Mini Glue Dots to secure the button to the flower. Apply the "Joy" sticker to the flag.